It was R. Buckminster Fuller who once said, "In order to change an existing paradigm you do not struggle to try and change the problematic model. You create a new model and make the old one obsolete." 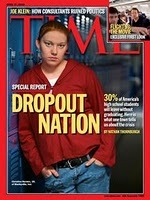 Last week's TIME magazine article, Dropout Nation, brings out an excellent look at an existing paradigm that we seem to be continually going around in circles to change, rather than simply creating a new model of how we treat each other that is compassionate and builds strong, productive learning communities. Sarah Miller, 28, was victim of those old ways (of telling unmotivated students to quit that did not have academic success within the traditional "disconnecting" teaching model). An intelligent but rebellious teenager with a turbulent home life, Sarah began falling behind in attendance and class work her freshman year. Like many other 15-year-olds, she had a talent for making poor decisions. She and her friends would often skip out of school after lunch and cruise up and down Broadway. Teachers rarely stopped them, but school authorities knew what she and her friends were up to. One morning Sarah went to the school office to discuss getting back on track but got a surprise. One of the administrators asked her point-blank, "Why don't you just quit school?" "I was just a kid," says Sarah with a laugh. "It was like they said the magic words. So I told them, 'O.K.!' And I left." Sarah never set foot in a high school again. She got her GED, but now she's too afraid to try community college, she says, because she doesn't want to look stupid. Although she has a house she owns with her husband and a fine job serving coffee, biscuits and small talk at Ole McDonald's Cafe in nearby Acton, Ind., Sarah is not without regret. "It would have been nice to have someone pushing me to stay," she says. "Who knows how things would have turned out?" The solutions we seek to create a new educational model and make the old one obsolete are simple. Implementing 3 self-effacing questions is forming a new habit and therefore a new model from which positive change will occur. What is the truth about how I really feel about this child? What can I do attitudinally to make this situation better? How do I prefer that my experience with this child be? When each person on the faculty and staff is simply encouraged by their administrators to simply, honestly and courageously answer these 3 questions, then and only then will there be a new model that replaces that which is obsolete. And as you know, leading begins as the top so if you don't do it yourself, then you can't lead it! Begin where you are, little by little you will make a difference which will in turn cause an exponential accumulative effect.